Lagos slums business opportunities are often considered to be lucrative since Lagos slums account for more than half of the entire citizens of the mega city. Lagos as a mega city has population of over 30 million residents and the figure is expected to grow exponentially in a couple of years according to African Property Investments (API)and that figures includes the population of those living in different Lagos slums across the state. The government both at federal, state and local are unable to adequately care for the wellbeing of the citizens in term of investments in infrastructure, affordable housing, good water supply due to excessive concentration of people in these Lagos slums and that provides excellent business ideas for those living in these slums should they recognize it. Here are the top 5 hidden Lagos slums business opportunities that can fetch you a fortune this New Year. Lagos slums business opportunities wouldn't be complete without mentioning toilet and bathrooms rentage services. One thing Lagos slums lack over the years has been good sanitary system. The closest at hand has always been the open waters where the inhabitants defecate. A sound startup entrepreneur who can tap into this particular Lagos slums business opportunity will be making a fortune in no time as he will be meeting the need of several people who constituted a ready market. One resource that has never been in short supply when it comes to Lagos slums business opportunities has been the manual labour which is largely due to the large influx of residents who are leaving the mainland to the downtown in an attempt to avoid excessive high cost of accommodation. But for a startup entrepreneur with eyes for gold, he will recognize that this is one of the sensitive areas in term of business opportunities available in Lagos slums. Investing in a business which involves manual labor would be really viable and there will be ready supply of resources at of course comparatively cheaper price. There are lots of such construction works going on and they are far from being enough so there you have a robust industry where your micro business can thrive. You ask how? I know this because construction sites as well as other businesses, managed by individuals or corporate bodies, require a number of laborers with manual labour man-hours. 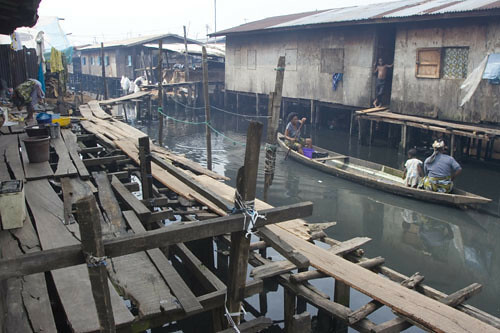 What is the main single reason why an elite or a learned person would leave the uptown Lagos for places like Makoko? My answer is “…to get affordable accommodation”. Nowhere in Lagos is accommodation as cheap as in Lagos slums. Just like this challenge is related to every mega cities around the world, any smart entrepreneur who can afford to pull up capital and initiate ideas that solve this problem will definitely be smiling down to the bank in a while. One of the ways to exploit such Lagos slums business opportunities would be to build mobile/de-construtable building probably of 10x10 square ft. Each of this building would be rented out at an unbelievable price that will guaranty you returns on your investments. 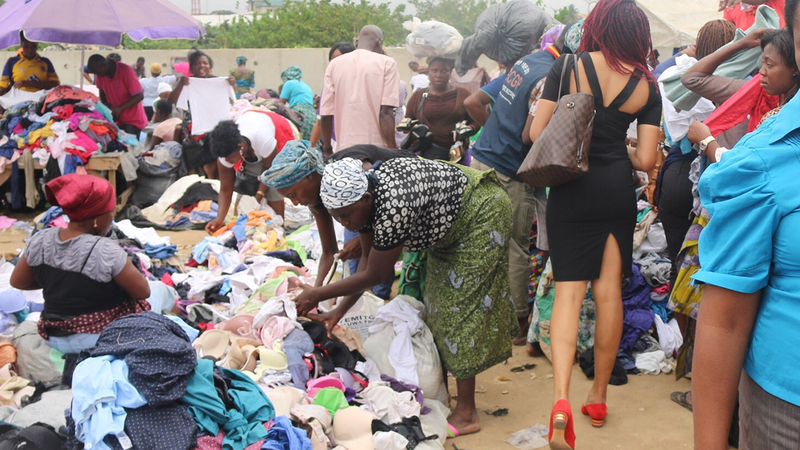 Opening a store where used items are sold would be one of the best Lagos slums business opportunities considering the fact that not everyone living in the slums can afford visiting Shoprite or mega boutique where the big boys and girls do their shopping. All a startup entrepreneur need is to gather some capital enough to open a store where he can sell a variety of different secondhand items. This is often a hot cake since the Lagos slums inhabitant’s main go is to stretch their income further. There is a challenge here though. No one will be looking at you while you catch all the fun and make more money. There’s bound to be stiff competition. Once of the ways to minimize such competition is to go for something on the wholesale level and be the supplier to the dwellers who are into such business already. The love for sport has been on the increase in Nigeria especially in South West thanks to Yoruba sport presenters who has contributed to fueling this passion through presentation of sport programs in local dialects. This particular phenomenon has turn Nigeria to haven of football betting company in Nigeria and you can make your fortune too while living in Lagos slums. All you need is to get a license from one of these betting shops as their retail agent, get probably a used computer and off you go to make hundreds of thousands in Lagos slums. As a smart entrepreneur with the right business development strategy, if you can mobilize fund enough to open a football viewing hall and combine it with football betting, you might hitting a jackpot.